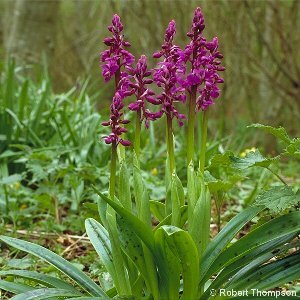 Early Purple Orchid (Orchis mascula) is the earliest wild orchid to flower. 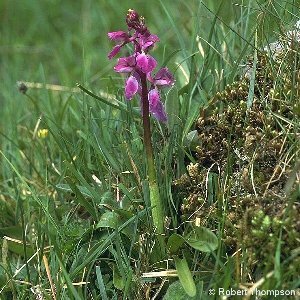 It is probably commonest on roadside banks and ditch-sides on quiet country roads, but also grows on sea cliffs, in open woodland or scrub and a wide variety of other places. The flowers are rosy coloured to purplish, appearing in April and May, and are pollinated by bees; the production of seed is probably followed by the death of the plant. The leaves are broad and blunt and may be unspotted or spotted with purple blotches. The roots consist of roundish tubers. 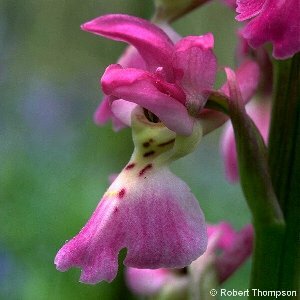 All names: Orchis mascula (L.) L.